The dense smoke from the Hurtigruten which is outside Ålesund. The fire must have started in the engine room. Two people are injured. Published Today 09:30. Updated Today 10:03. LATEST: Norwegian Coastal Voyage has docked. Police said the burning of the Hurtigruten Nordlys that are on the way to the quay in Ålesund. Rescue Crew is on the way to the place. The situation is unclear. - There is an unresolved fire in the engine. We will try to get the Quick Route to land. Thurs rescue helicopter is on its way, says Stein Solberg's rescue inspector at the Main Rescue Coordination Centre of Southern Norway. Fire department, rescue boat, police and ambluansar is in place. There are 262 people on board. Police and Main Rescue hopes to get Hurtigruta quickly to shore. There are 262 people on board. Stein Solberg said the situation is serious. - There is a serious situation. We have a fire in the machine, which is damaged and there is no progress on the shortcut route. We hope however that there are more injured than two, says Stein Solberg. Smoke development is so strong that the whole center of Ålesund is smoke added. Police ask people to turn off ventilation systems and leave back windows. - It's dense smoke. We hope now that we will ship to shore as soon as possible, says operations manager Arnfinn Valderhaug at Sunnmøre politidsitrikt. Communications Manager, Hurtigruten, Ragnar Nordum says to NRK that the situation is confusing. He does not know how it goes with the injured. - The main focus is to ensure the ship, get it to shore and get the passengers and crew on land, he says. Let's hope there are no casualties. Quite moving when you remember the TV coverage earlier this year. Reports of 2 dead, 2 missing and several injuries. Sad news, let's hope the casualty list doesn't rise. I took this photograph of her in happier times, in Geirangerfjord a couple of years ago. Is it likely that the fire could be of such an intensity that it would eventually burn through her hull and allow flooding, or might they be deliberately flooding the engine room ? 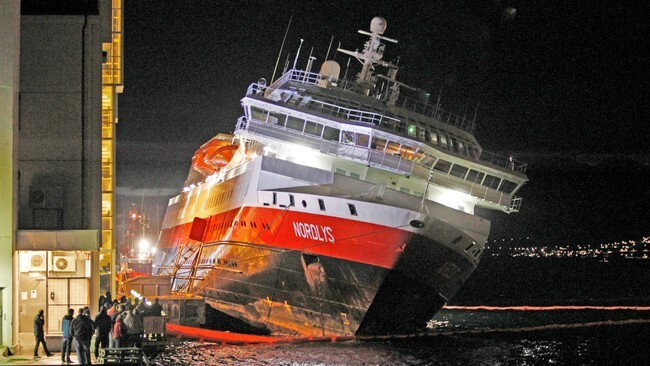 Reports on the Norwegian websites are suggesting that there was an explosion which breached the hull, and more water was coming in than being pumped out, but divers appear to have stabilised her tonight. The following link takes you to pictures of Nordlys in happier times when I photographed her at Trondheim in 2006. In those pictures she still bore the funnel livery of the old Troms Fylkes Dampskibsselskap company (founded in 1866). Soon after it was merged with the Ofotens og Vesteraalens Dampskibselskab (the Ofoten & Vesteralen Steamship Company). This company resulted from the merger in 1988 of Vesteraalens Dampskibsselskab (founded 1881) and Ofotens Dampskipsselskap (founded 1936) Since1st March 2006 the joint operating company has been known as Hurtigruten Group ASA.